Sew The Show is a great monthly event that allows sewists to grab inspiration from their favorite shows and movies and create fun and interesting new looks. 6 Degrees of Kevin Bacon is an awesome party game that I am super bad at because it takes me so long to come up with answers. 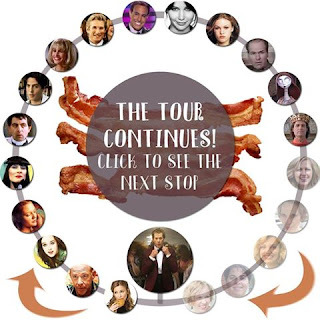 But the overall goal is to link as famous person to Kevin Bacon through 6 or less costars/significant others/directors etc. I am a bonus stop from the amazing Cassandra over at Pear Berry Lane, so give the big graphic a click and check out her post also! And of course all of the amazing talent in this massive tour! And my connection is The Princess Bride! The Princess Bride has been one of my favorite movies for as long as I can remember. I used to wait patiently for it to come on and record it with my VCR so I could watch it repeatedly until the tape would actually wear out. Then I would just tape it again. Of course, I have now graduated to DVDs and Blu rays but the outcome is the same. While most girls dreamed of a love like Wesley, I dreamed of having the cool demeanor of Inigo Montoya. He truly inspired me because he used his adversity to become accomplished and remained steadfast in his journey. So the question is how do I get cool like Inigo Montoya? And the answer is an awesome jacket and boots outfit of course! 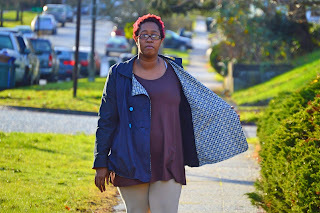 So I pulled out my favorite pattern from Winter Wear Designs, the Provence Pea Coat. 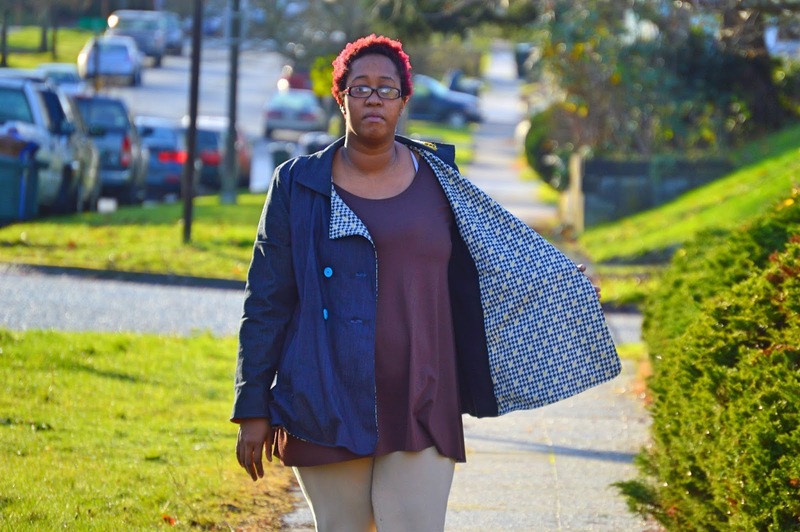 It is the perfect coat for the rainy Washington winter months. There is the option to fully line it, like I have because I am eternally cold... or just use facings, which I will do in the spring. There is even a detachable hood, which is cut out but not sewn, please forgive me! 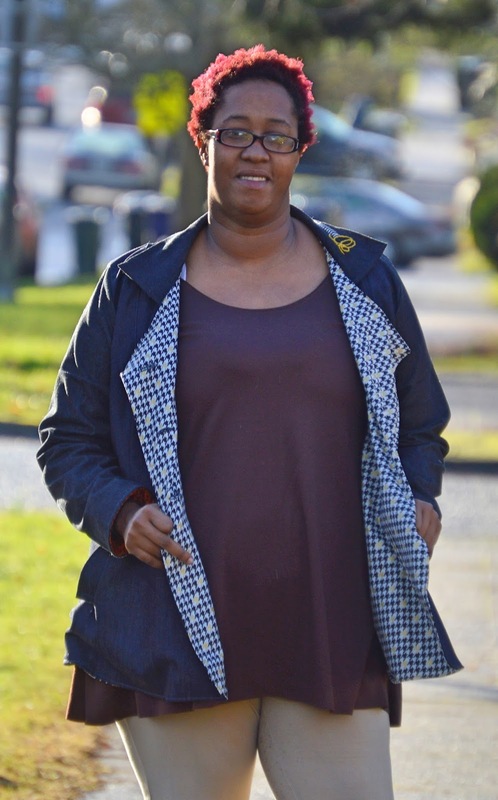 I used a stretchy denim that I got from Joann's for my outer layer of my coat. My lining is a combination of a houndstooth woven that I fell in love with at Walmart and a plain black fleece for extra warmth. Even at 6 feet tall, this coat fits me well and gives me enough room to be comfortable. And I love the professional look of it! People can't ever believe that I made my own coat. 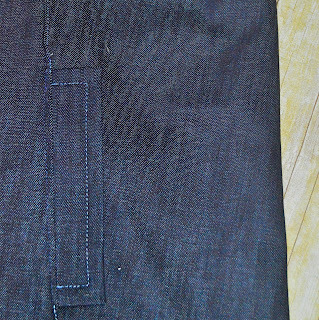 I love the little details like the welt pockets and the top stitching. And because I needed to pay a little homage to my favorite man, I hand embroidered my abstract version of Inigo Montoya's sword on my collar. I think I might not be getting worse at this embroidery thing! At least I had fun doing it. After looking for my favorite brown boots, I discovered that I didn't have a shirt in my drawers that would look good with this ensemble. So back to Walmart I went to grab some chocolate brown knit and whipped up a Laundry Day Tee by Love Notions in under 20 minutes (not counting the trip to Walmart). I didn't even put a neckband on it. 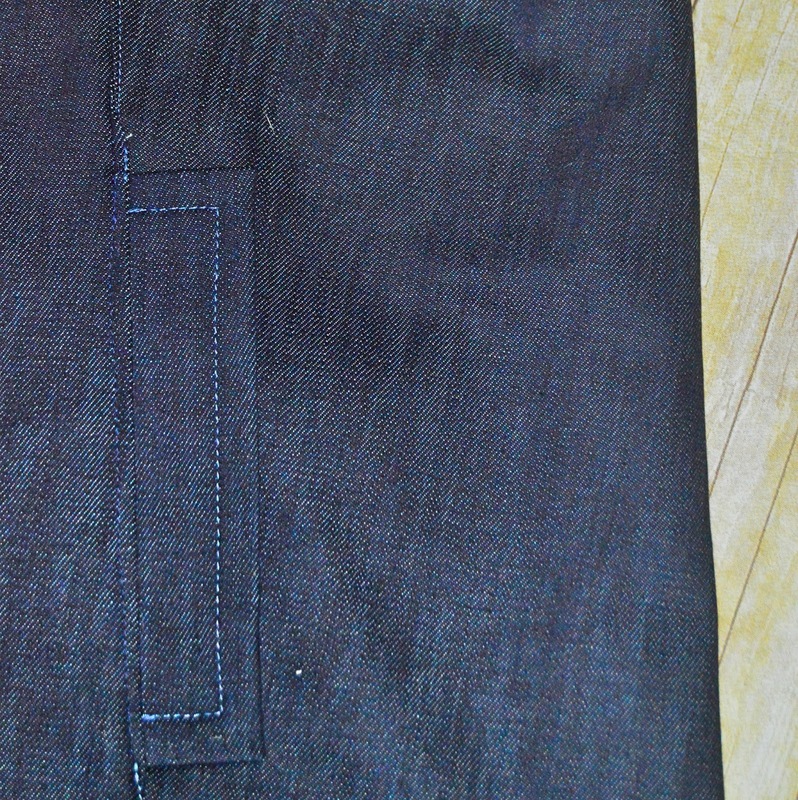 I am not modest so I simply folded the neckline over approximately .25" and used a zig zag stitch to secure it. I live in these shirts. I probably have one in every color you can think of. I graciously gave you the link to the facebook group where I "heard" there was a code to get the LDT pattern for free! Tell 'em I sent you! Wow! I had so much fun with this! I can't wait to sew the show again! And you should sew the show too! And then head to the facebook group and show off your creations! But first click some of these links and see the other degrees of supreme talent and separation! Wow, way to go. You've got skills girl! 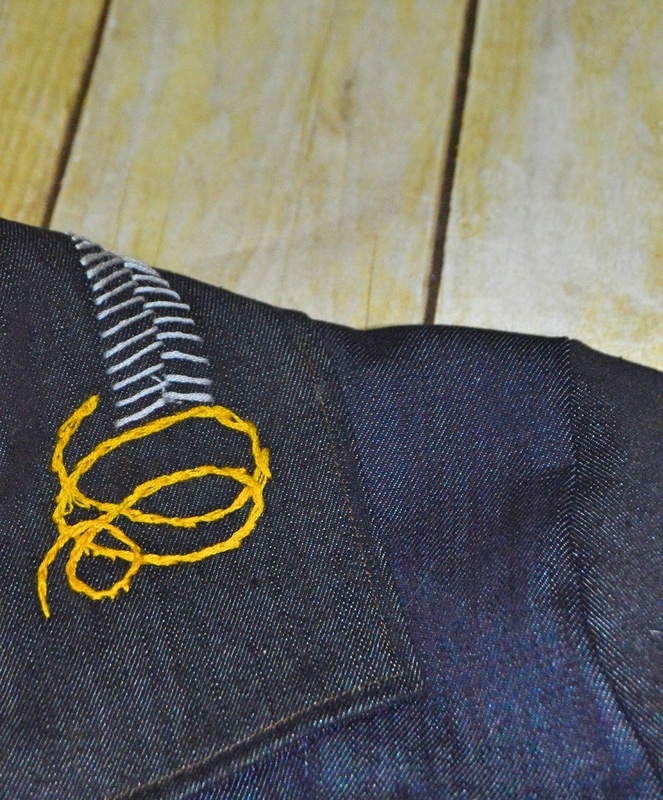 Love the touch of embroidery too. WHAAAAAAT!? THAT ABSTRACT SWORD DESIGN IS AMAZING! Beautiful coat! I LOVE it! It looks so well made! Christmas Fun With A Vision To Remember!